These perfumes were sent gratis from Julia as a gift. All opinions are my own. I purchased a few Arcana Wildcraft Yule Resurgence scents and with them Julia sent the Yule Deer Collection. I will chat about the ones I paid for in a few days but I wanted to start out with these since they are so lovely, brand spanking new and currently in stock. 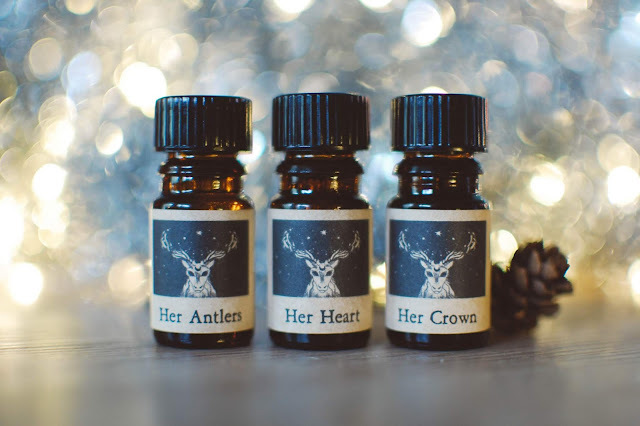 These scents are $28 each and draw inspiration from the Reindeer Goddesses. Her Antlers- Notes: A symbol of her proud countenance. A rugged blend of Moroccan Atlas cedarwood with dry, woody amber, melted honey and a chunk of rich labdanum. Noble cedar flesh shining with citrine and yellow topaz effervescence is tempered by the dark sticky fond of my beloved labdanum when inhaled straight from the phial. Applied along the soft nap of skin the perfume speaks of the duskiness of rich labdanum. Labdanum is a resin that is birthed from the cistus, or rockrose, shrub and often appears in amber accords. Much like vanilla can smell an infinite variety of ways from boozy to wooden, milky cream to a floral orchid heart, labdanum can run the gamut of facets as well. 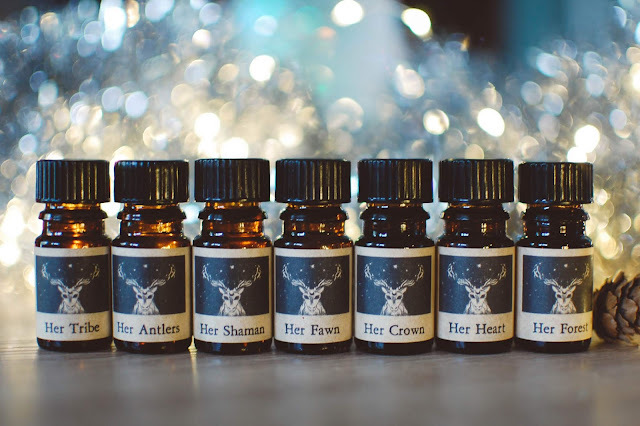 Within Her Antlers and fresh on the skin, the labdanum manifests with leather and hearth tones. The other notes simply exist to enhance the abundant beauty of the caliginous and snuggly resin. This perfume smells like how I feel when I am enjoying solitude by candle glow in a quiet, safe and warm space. The drydown of labdanum tends to swerve a little animalic on my skin and this one does too but I enjoy a little purr in perfume. If I could persuade you to try a fragrance, it would be this. Her Heart- Notes: Rose attar and rose geranium with sweet clove, ylang ylang, sticky blackened amber, tobacco, jasmine absolute and Mysore sandalwood. I find as I get along in my perfume journey that I love rose but I am terribly particular about how it is presented. I like a plush shadowy rose that has a bit of darkness to it. Green, bright roses with sharp edges push me away. This is a dark rose. The burnished burgundy hue of a deep and powerful heart. Pressing my nose to the bouquet of perfume unfurling from the amber glass divulges the secret gathering of precious blossoms and sacred woods in a tenebrous glen. The sandalwood soaked rose oils gleam in umber hues. On the skin Her Heart flows like a thick salty tide of rose attar that pulses with sanguine petals and smoky sandalwood, the inner tide that ebbs and flows from the heart. Nocturnal jasmine and spiced tobacco shade the rose attar with the low susurrus of dark blood pushing along its curling and intimate trails. Eventually the rose fades and a softly smoked amber lingers pleasantly. This scent is powerful yet gentle, dark and velvety, otherworldly yet painfully familiar. I love it. Her Crown- Notes: The essence of a delicate crown of flowers. Wild-harvested lavender and French lavender absolute with gardenia, ivory tuberose, jasmine sambac vies, fever grass and citron. Liquid flowers. Creamy gardenia and tuberose and jasmine experienced beneath the chilled burble of a crystal clear stream, this is what pours from the bottle. Damp on the skin the flowers break the surface of the water and illuminate the skin with their creamy and indolic aromas. Their intimate pollen filled anthers and swollen sigmas brush against the skin and impart jolts of nectar, banana, cream, sweat and flesh within a heady white floral heart. Her Crown is lush and bountiful, dew drop riddled. A glinting of citrus sparks along the florals for a moment before the headiness subsides into a watery garden once again. As the crown of flowers settles back into its stream some grassy vetiver strands sway along the edges of the moving water. A lovely white flower perfume that smells of wild spaces. 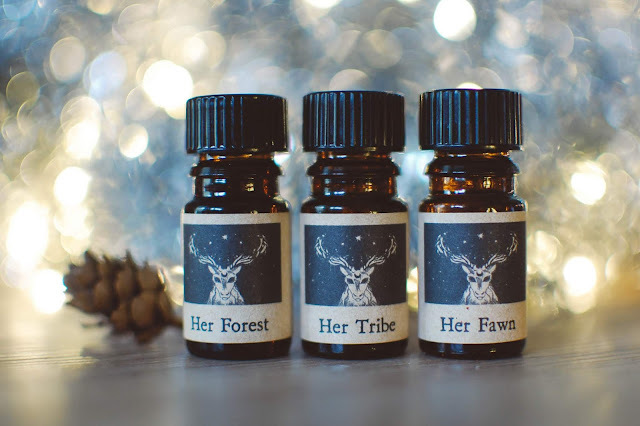 Her Forest- Notes: Layers of velvety forest mosses and soft green lichens with wild-harvested Northern fir tips, Bourbon vetiver, black oudh and a hint of forest floor. The notes on this one. They all speak to me. Sniffing gently from the vial the fir tips tumble out and scatter while notes of damp humus and grassy vetiver tease out between the evergreen tufts. Dappled onto the skin like sun through the leaves, the forest floor awakens and shakes itself from the winter slumber. The brackish leaves rustle like scales on a great beast, tannic and loamy. As the hide shivers and stirs the trees tremble and drop their needles and greenery in a waterfall of foliage. Papery skinned lichens and the dry curled tresses of moss float like confetti in the energized air, taking an indiscriminate path down to the earth. They possess a dried grass quality that hints at earthen romps in childhood. Her Forest burrows down into a gorgeous midnight oudh with a sweet resinous foundation. This has my heart. Her Tribe- Notes: Her people follow the Great Herd. Powerful sandalwood, Omani frankincense, delicate neroli blossoms, wild sweet orange, 13 year aged patchouli and red dragonsblood. From the glass rises a lively and bitter neroli that clears the mind and palate like a purifying tonic. This really is a powerful scent and intense experience once it hits the skin. The neroli flashes brilliantly then quickly makes way for the caravan of frankincense and resins much like a supernova giving birth to the elements to drift among the universe in a procession of life. Her Tribe might just be the sleeper hit of the collection. Golden incense waltzes with sugared mandarins and ruby red Dragon's Blood. The array of sunset hues sparkles on the skin. Incredibly energizing and grounding. As the twinkling resins and citrus move on into the distance, a mineral bearing patchouli rolls in. This is a beautiful patchouli that is warm and wooden but with a sliver of metal running through it. The sweet pulp of oranges continue to mingle with the patchouli to further round and warm it. A beautiful marriage of scents. Her Fawn- Notes: The scent of innocence itself. Soft brown velvet, skin musk, reindeer milk accord, rich butter CO2 extract, copaiba balsam, white iris, beeswax, maple sap and a sliver of dry coconut. Sweet, buttery milk. A touch of musk. This is breathtakingly beautiful and strange. From the bottle to the wrist the perfume dances around that ethereal creamy musk. A slight whiff of coconut rind and old books creeps around the edges of the milkiness and then the heart opens up to reveal a fragile iris bulb in full bloom. This fawn with a powdery soft coat and a half moon belly full of mother's milk that is fragrant with bulbs and sweet honeyed plantlings springs on impossibly dainty hooves in the golden haze of dusk. 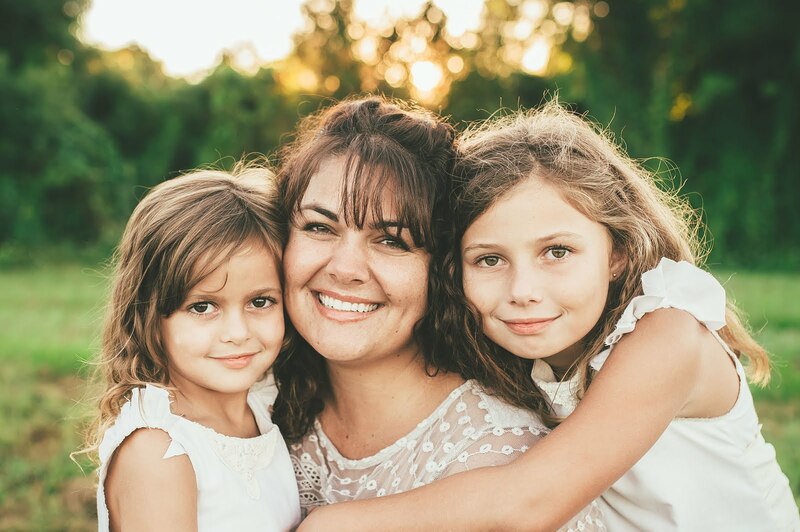 She orbits around her mother, guided by the tawny musk that pulls like gravity. Don't be scared by the butter note, it only serves to round out this scent into a well blended beauty that is more than the sum of its parts. I really do love the allusion to old books and wooden desk that I get from time to time. This one is special. 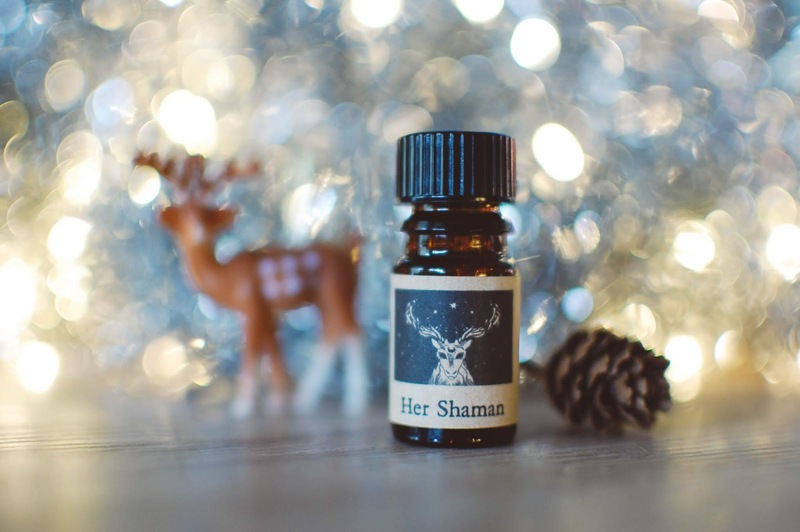 Her Shaman- Notes: A spiritual medicine bag filled with golden chamomile, wild cannabis, mugwort and patchouli leaf rests on a bed of Canadian black spruce and silver pine branches. Unscrewing the cap is like loosening the strings on the small leather medicine pouch, a rattling and papery collection of dried chamomile heads, lavender sprigs (must be the silver pine that is making me things of this herb) and various greenery, seeds, roots and buds that live also with a stone or two and a bone and feather. Smudged onto the inner arms a lemony tincture of chamomile acts as aromatherapy of the very best sort. This is inhaling the steam from a hot mug of chamomile tea with a drizzle of honey and a squeeze of lemon to erase the hectic from the day, to sooth the hackles and induce placid thoughts. Once the chamomile vapor diffuses the shaman pinches the verdant spruce and pine needles from the pouch and grinds them between weathered fingers, releasing their fragrant sticky life blood to mingle with the gentle herbs that have been pinched and harvested with intention and permission with the very same hands. Visions of grasses, brush and saplings mix their vibrating chloroplasts with the microscopic life that teems in the soil unseen but as abundant in one teaspoon as the peoples that populate the entire planet. This is the scent of life. Of healing medicines. I just love the artwork on these bottles. The names are brilliant. The scents are brilliant. Julia has been tucking awesome stickers into each order and I love those too. I have been putting them on my planner to remind me of my year's olfactory experiences. I am head over heels for this Yule Deer Collection. Normally I can easily picked two or three standouts but these all are so varied and individually lovely that I simply cannot. I will be wearing and enjoying these all for a long time to come. This whole collection sounded so awesome, but I just grabbed a decant of Shaman and Tribe. From Yule resurgence, I just got a decant of Tinderbox. I should receive them in the next week or two. I can't wait!! It really is beautifully rendered. I hope you love your decants. Let me know your thoughts when you get them and try them on! I picked up Tinderbox for the first time too. I enjoy it greatly. Merry Christmas!! I still have to dabble more into my Blood Moon Botanica goodies and let you know about that. I'm so behind.. holiday stuff and trying to always better my health has been priority. I hope you have a beautiful, memorable Christmas and New Year's celebration with your loved ones, Julie! Bettering the health is definitely the better priority!!! I will be getting in that frame of mind tomorrow too. (Not today.... it is Christmas... time for hot cocoa and peppermints.) Merry Christmas and Happy New Year! I saw your Rosegirls store trip haul! How exciting!!! You may have persuaded me to try Her Antlers, sounds divine, although leathery notes scare me a bit. If only perfumes were an option for wearing to work, I'd be much more willing to spend on them. I think I'll make an effort to try a few more next year, just for weekends and play. It is so lovely. Warm and inviting. I think you could have fun at Ajevie shopping for samples and decants. That way you aren't spending $28 on a full bottle of something you might not enjoy. In fact.... I am a knucklehead. I will send you some decants and you can try them out. Duh. LOL! Gotta be some perk to being my friend. The oils wear much more close to the body so maybe you can wear just a drop or two. I immediately fell in love with Her Fawn and yes! I absolutely picked up on a papery note. I also thought there to be a toasted essence to it, perhaps that is the coconut husk or maple note? Whatever it is, it's strange and wonderful and decadently creamy. I've only a drop left of Her Fawn and have worn the familiar beauty, Her Heart second most often, appropriately for most of Feb. (we have a strict fragrance-free policy at the library which got a whole lot stricter now that I work in the office where the policy originated due to allergies:/) but I wear the decants on weekends and special occasions and refuse to give up my natural deos. Think I'll try Her Shaman today, as we're attending an Agatha Christie drama and that one smells most mysterious to me. Oh thank you again, it's been fun matching these up to moods and occasions-for the upcoming March weekends, I think I'll fancy Her Crown as it's so bright and spring-like, a truly happy scent. I'm so grateful for your friendship and I have missed you, hope to catch up on plans, books, scents and the rollercoaster that is 2019 thus far soon. I don't have much coming in, but will gather a few bits to send your way over the next month. Have a relaxing Sunday and rest of your week. It thrills me that you picked up on the papery tones with Her Fawn too. I really did bring to mind that old book smell in the best possible way. Only fitting that you got to wear it. I hope you enjoyed Her Shaman. It is quite a mysterious scent. Agatha Christie drama?! How fun! I have only read two of her books but very much enjoyed them. I still need to see the Orient Express movie that came out a couple years ago. I am such a slacker.